A camper has parked at one of the sites for at day or two at the Firerock Campground which is located along the shores of Elkwater Lake in Alberta, Canada. In the wilderness of Cypress Hills Interprovincial Park in Alberta, Canada, visitors will find serenity while camping at Firerock Campground. 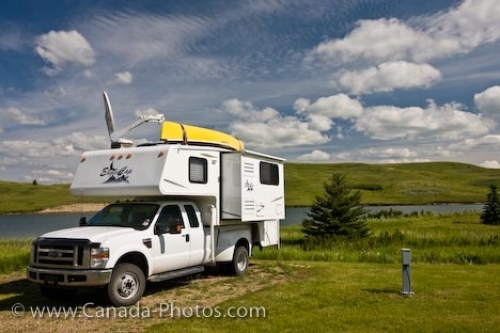 Tourists have pulled their camper into a site located in a wide open field which looks out over Elkwater Lake. People have a choice at Firerock Campground to pick a site along the lake or camp further up the hill where the sites are fairly private and surrounded by trees. This campground is approximately 35 kilometers southeast of Medicine Hat and another 35 kilometers south along the highway, just west of the town of Elkwater. Camper at Firerock Campground in Elkwater, Cypress Hills Interprovincial Park, Alberta, Canada. Picture of a camper along side Elkwater Lake at the Firerock Campground in Cypress Hills Interprovincial Park, Alberta.